Join us on the evening of Tuesday, April 2nd or the afternoon of Sunday, April 7th for our introductory tasting sessions. We will feature four of our coffees (of your choice!) for a tasting session. 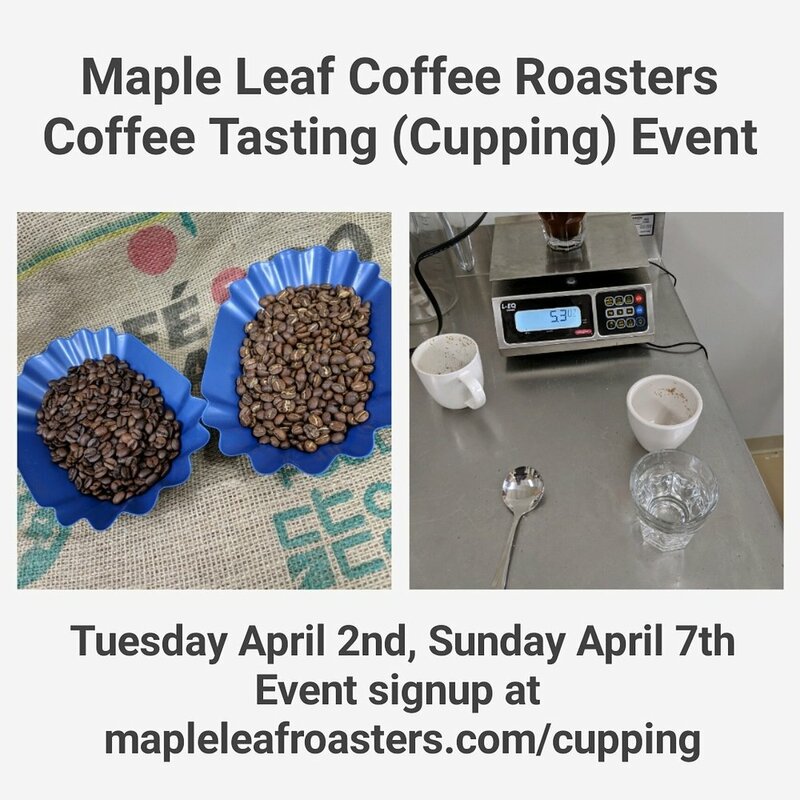 You’ll learn how coffee cuppings are performed, the elements a roaster will look for in coffee and a ton about the process. Space is limited so please let us know if you are interested in attending. You can register to attend at either our Eventbrite page or send us a message on Instagram, Facebook or via email to attend. Our newest arrival is our first standalone Kenyan coffee — Kenyan Kiambu Kiriga AB. This coffee is the replacement for our Ethiopian Sidamo. You won’t mistake this for anything other than a classic Kenyan coffee. If you are a sharp coffee fan, this will be right up your alley. Up front you’ll notice a sharp acidity and some sweet, honey flavors coupled with subtle chocolate and herbal spice notes. This coffee is available as of January 19th in our physical store or via our online store. We are considering hiring an employee to work with us at the roaster but before we go that far, we need to know which additional hours would be best for us to be open. If you have trouble getting in to see us or would prefer some better times for your schedule, let us know in the survey below. Your answers will help us make decisions about our hiring and staffing needs. We do not need to know who you are but if you want to leave your name or other contact info in the comments, we’d love to know who helped us out. Should we attempt to be open extra hours Monday through Friday? Should we attempt to be open more hours on the weekends (Saturday and Sunday)? Is there a day (or multiple days) of the week you really want us to be open? Do you have any general comments or feedback as we consider adding more hours?